With Pascal Jürgens [@pascal], and Harald Schoen I wrote a short blogpost for “Zweitstimme“, the blog formerly known as “Politik nach Zahlen“, a blog focused on empirical research on elections, hosted by the German newspaper Die Zeit. 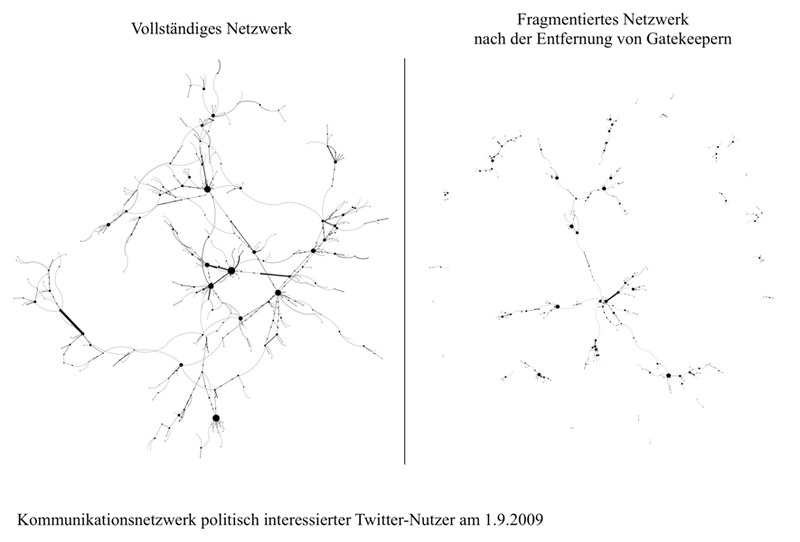 This time we focused on a phenomenon discussed in a study Pascal and I did on political twittering during the campaign for the federal election in Germany 2009. In “Alle Twitterer sind gleich, aber manche sind gleicher: Neue Gatekeeper und ihre Bedeutung für die Verbreitung von Nachrichten auf Twitter” we show the importance of highly connected users in Twitter conversation networks for the flow of political information through the whole conversation network. As shown above these highly interconnected individuals are crucial for the information flow through the network of politically interested Twitter users. For a more comprehensive discussion of this idea please see the blogpost or our forthcoming paper Pascal Jürgens and Andreas Jungherr (2011) “Wahlkampf vom Sofa aus: Twitter im Bundestagswahlkampf 2009”, in: Eva Johanna Schweitzer und Steffen Albrecht (Eds. ), Das Internet im Wahlkampf: Analysen zur Bundestagswahl 2009, Wiesbaden: VS Verlag (forthcoming). 1) How important is the fact that social media became a tool for grassroot-rioting? Protesters use social media channels for the distribution of information. This information is used internally to organize the protest (for example: Where and when do we meet? Where is the police? What are the reactions of the politicians?) as well as externally to get news and pictures of the protests to an international public. Both these functions are not new. A few years ago protesters used mobile phones to achieve similar goals. The widespread use of social media introduces a new speed and scale to the process. This facilitates the decentralized organization of a protest and increases the international visibility of protesters and the reactions to them by governments. Still, this does not make social media the trigger or reason for the protests. 2) What kind of changes will this bring? Should we get ready for the age of censorship on behalf of the scared governments? A growing adoption of social media tools by activists will lead to a higher international visibility of their causes. While traditional news media in the West largely ignored the Egyptian protests an international public was kept aware of the daily developments by social media channels. Also the internationally accessible video stream on the website of Al Jazeera was a very important source of documentation. Social media channels lead to a circumvention of news selection biases in the West, which in turn massively increased the visibility of the protests. This phenomenon is likely to increase. Also the use of social media tools allows protesters to document themselves and thus avoid the filter of traditional news organizations. The iconic potential of pictures taken with camera phones during protests was demonstrated during the recent protests in Iran and will likely reassert itself during the ongoing protests in Tunisia, Egypt, India, and Yemen. The attempt of the Egyptian government to defuse the protests by cutting access to the internet has been largely futile. Thus it probably serves more as an example of the limited effect that censorship attempts by governments hold than as an use case for future events. 3) Are you enthusiastic or skeptic about the instrumentalization of the social media by the revolutionaries? On the one hand it is inspiring to see how activists are able to use social media tools to organize collective action, on the other hand the widespread use of these tools can also increase the volatility of public opinion and thus negatively effect the stability of states. Right now it is easy to applaud the protests since they address issues in the countries in question that are widely seen as negative (i.e. corruption, authoritarian style of government) but there is no guarantee that these tools will only be used by political actors who follow commonly accepted goals. Social media tools are themselves no agents for good or evil. Their role in stabilizing or destabilizing states will always depend on the goals of the actors who use them. 4) How important were the social media in triggering those events (in Egypt, Tunisia, India, Yemen)? Were the riots spontaneous or orchestrated via social media? It is to early to answer what the role of social media was in triggering these events. Again, I do not think that social media were the trigger let alone reason for the protests. For those one has to look at the situation in each of the countries in question. It seems likely though that social media tools helped to distribute the news of successful protests in Tunisia to other countries. Egypt, India, and Yemen were also, albeit for different reasons, in a volatile state. So maybe the news of the events in Tunisia helped to inspire activists in those countries to take to the streets and get their country specific demands heard. 5) How justified are the claims that behind the social media are the western powers who use them in order to bring change in authoritarian countries? Again, it is to early to answer this question. Personally I tend to doubt the claims that Western powers orchestrated social media protest to achieve regime change in authoritarian countries. It seems to me much more likely that the protests are emergent phenomena, that started in each country out of different reasons. The common theme is their successful use of the internet as a communication medium. But this common element should not lead us to underestimate the different reasons and motivations between the protests. To assume Western powers as conductors of these events seems to me an oversimplification of the events. With Pascal Jürgens [@pascal], and Harald Schoen I wrote a short blogpost for “Politik nach Zahlen“, a blog focused on empirical research on elections, hosted by the German newspaper Die Zeit. This time we focused on two results from the study Pascal and I did on the usage data of the German e-petition system. 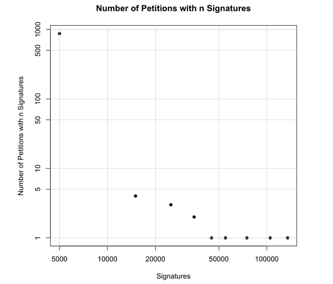 In Auf der Jagd nach den 50.000 Klicks: E-Petitionen in Deutschland we showed the development of co-signatures over time. We also introduced the concept of the co-signature overspill. We found that the daily number of co-signatures of e-petitions below a total of 10.000 co-signatures rose when highly successful e-petitions were active. This is shown by the development of the black area in the graph above. Also we showed that only a very small number of e-petitions collected most of the co-signatures on the e-petition platform. These and other results of our analysis can be found in Andreas Jungherr and Pascal Jürgens (2010) ‘The political click: political participation through e-petitions in Germany’, Policy & Internet, 2(4) Article 6.